, a celebrated philologer, was born December 3, 1560, at Antwerp. He was the son of John Walter Gruter, burgomaster of Antwerp; who, having, among others, signed the famous petition tq the duchess of Parma, the governess of the Netherlands, which gave rise to the word Gueux (Beggars), was banished his country. He crossed the sea to Norwich in England, taking his wife (who was an English woman) and family along with him. 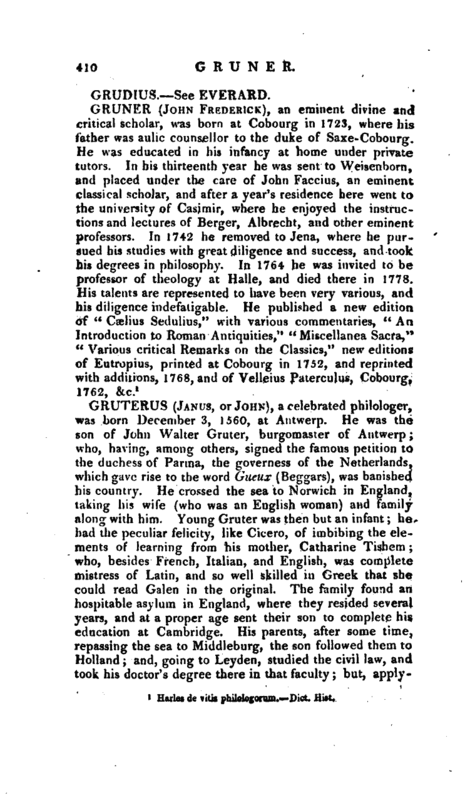 Young Gruter was then but an infant; he had the peculiar felicity, like Cicero, of imbibing the elements of learning from his mother, Catharine Tishem; who, besides French, Italian, and English, was complete mistress of Latin, and so well skilled in Greek that she could read Galen in the original. The family found an hospitable asylum in England, where they resided several years, and at a proper age sent their son to complete his education at Cambridge. His parents, after some time, repassing the sea to Middleburg, the son followed them to Holland and, going to Leyden, studied the civil law, and took his doctor’s degree there in that faculty but, | applying himself at the same time to polite literature, he became an early author, as appears by some Latin verses which he published, under the title of “Ocelli,” at twenty years of age. After taking his degree, he went to Antwerp, to his fa ther, who had returned thither as soon as the States had possessed themselves of it; but, when the city was threatened with a siege by the duke of Parma in 15S4-, was sent to France, where he resided some years, and then visited other countries. 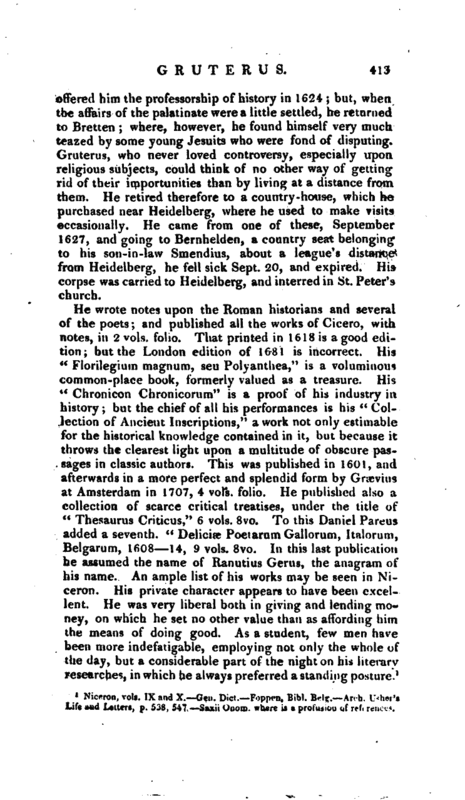 The particular route and circumstances of his travels afterwards are not known; but it appears that he read public lectures upon the Classics at Rostock, particularly on Suetonius. 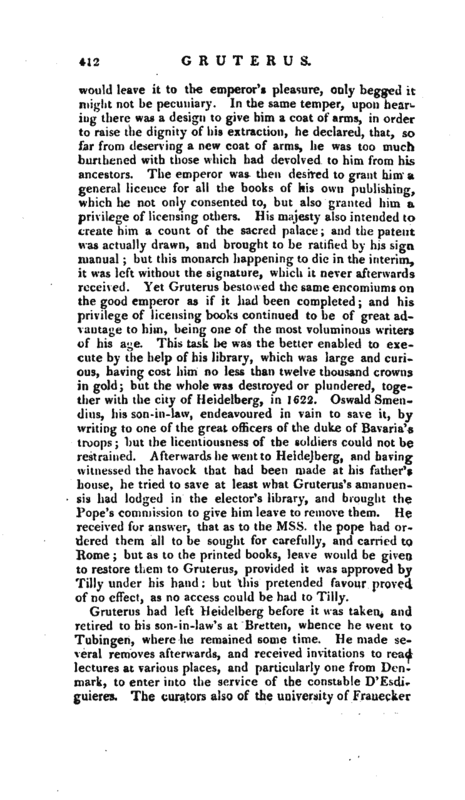 He was in Prussia, when Christian, duke of Saxony, offered him the chair of hi story -professor in the university of Wittemburg; which place he enjoyed but a few months: for, upon the death of that prince, his successors desiring the professors to subscribe the act of concord on pain of forfeiting their places, Gruterus chose rather to resign than subscribe a confession of faith which he could not reconcile to his conscience. 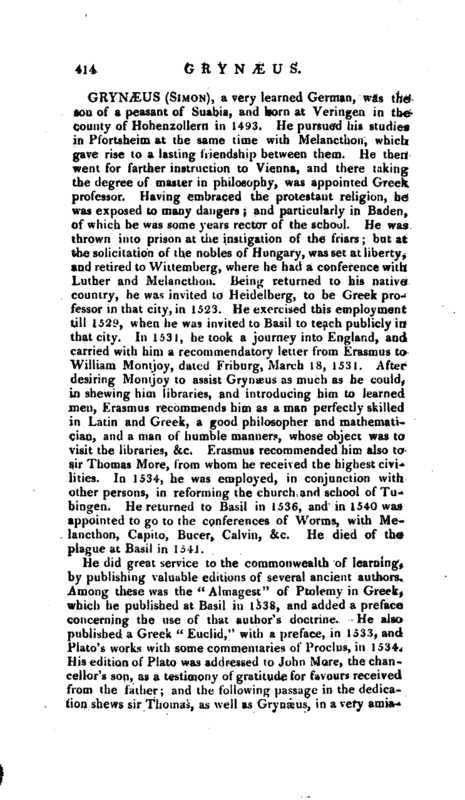 He was treated with particular seventy on this occasion for, while two others who were deprived on the same account, had half a year’s salary allowed them by way of gratification, according to the custom of those countries, with regard to persons honourably discharged; yet in the case of Gruterus, they did not defray even the expences of his journey. Where he went immediately after this does not appear; but we are told, that, being at Padua at the time of Riccoboni’s death, that professor’s place was offered to him, together with liberty of conscience: the salary too was very considerable, yet he refused all these advantages. He was apprehensive that so profitable and honourable an employment would expose him to the attacks of envy, and he would not submit to the bare exercise of his religion in private. He was therefore much better pleased with an invitation to Heidelberg, where he filled the professor’s chair with great reputation for many years; and, in 1602, had the direction of that famous library, which was afterwards carried to Rome. Gruterus had left Heidelberg before it was taken, and retired to his son-in-law’s at Bretten, whence he went to Tubingen, where he remained some time. He made several removes afterwards, and received invitations to read lectures at various places, and particularly one from Denmark, to enter into the service of the constable D’Esdiguieres. The curators also of the university of Frauecker | offered him the professorship of history in 1624; but, when the affairs of the palatinate were a little settled, he returned to Bretten; where, however, he found himself very mucli teazed by some young Jesuits who were fond of disputing. Gruterus, who never loved controversy, especially upon religious subjects, could think of no other way of getting rid of their importunities than by living at a distance from them. He retired therefore to a country-house, which he purchased near Heidelberg, where he used to make visits occasionally. He came from one of these, September 1627, and going to Bernhelden, a country seat belonging to his son-in-law Smendius, about a league’s distance from Heidelberg, he fell sick Sept. 20, and expired. His corpse was carried to Heidelberg, and interred in St. Peter’s church.